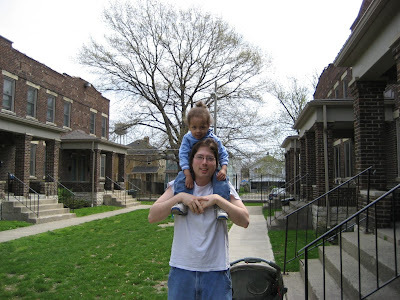 On Saturday, April 19, 2008, I participated in a walking tour of my neighborhood, Weinland Park. The purpose of this tour was to document how the physical environment of the neighborhood encouraged or discouraged people from walking or bicycling. I was very grateful for the opportunity to combine my desire to care for creation with my desire to be a caring and contributing citizen of Weinland Park. We documented cracked or crumbling sidewalks, poorly placed utility poles, jaywalkers, metal subs where signs one were, and two community gardens. As I understand, the final product of this and similar walks will be a report to the Columbus city government on how the “walkability” of Weinland Park can be improved. One of the participants on this tour was a little boy who became quickly attached to me. This provided much amusement for fellow walkers when my inexperience carrying small children quickly became obvious. After a few position changes and sore arms, I decided to carry him on my shoulders, where he remained for most of the walk, as you can see below. This entry was posted in Uncategorized and tagged Being a Christian Physicist, Creation Care, Weinland Park. Bookmark the permalink.